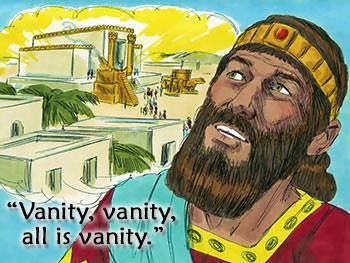 According to the Bible, man's biggest problem is his separation from God. This problem is solved when we repent of our sins and receive Christ as our Savior. This brings us into right relationship with God, but we soon discover that we have other problems. We have inner problems, such as anger, jealousy, resentment, worry, feelings of worthlessness, and other similar problems. The reason we have these problems is that we have deep needs which have not been met. 1. I must have significance. This means that I must have a purpose in life that is important enough for me to feel that my life counts for something. 2. I must have security. This means that I must have the security of being loved and accepted by someone who is important to me. In this lesson we will see how God meets our need for significance and in the next lesson, we will see how He meets our need for security. My life seems so empty and useless. If only I knew that I was worth something. I want to accomplish something worthwhile. I want my life to count. If only I could be somebody, maybe I could like myself and accept myself. Then maybe other people would like me and accept me, too. When God created the first man and woman, He put in them a desire and a need to feel that their lives counted for something. Adam and Eve were given a work to do. They were to take care of the garden which God had planted for them. They had daily fellowship with their Creator. They had true significance because they knew that they were part of God's great plan for the world. Because he has rejected God's authority and God's plan, man no longer has a purpose in life that makes him feel worthwhile. Man tries many things in his effort to meet his need for significance. The Bible tells us about one man who had everything his heart could desire. His name was Solomon. He was king of Israel after David. He was the wisest and richest king who ever lived. In the book of Ecclesiastes, Solomon tells how he accumulated silver and gold beyond measure. Using his great wealth and power he devoted himself to many projects. He planted gardens and orchards, he built cities, he built an elaborate palace. His greatest project was building the temple of the Lord. It was the most expensive, most magnificent building that the world has ever seen. In our time people are still seeking for something that will give them a feeling of significance. 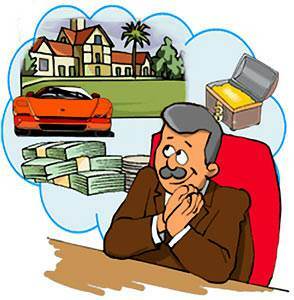 Some people work hard to accumulate money because they feel that money gives them a sense of importance. But money cannot satisfy our deep inner needs. 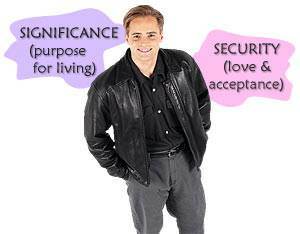 God designed man with the need to feel important and the need for a lasting purpose in life. But man himself cannot meet this need. Only God can meet it. God's way of meeting our need for significance is this: He puts us IN CHRIST. 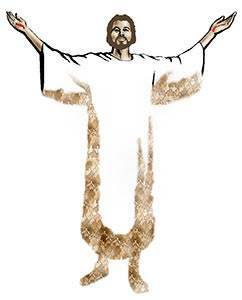 He makes every believer a vital member of Christ's body. God gives believers spiritual gifts and opportunities to use those gifts. 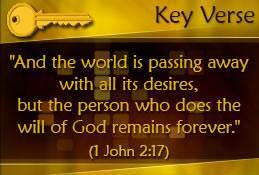 In this way every believer is significant because he becomes part of God's great eternal plan. Every believer is a member of Christ's body. In the book of Ephesians, God tells us that all Christians are members of the body of Christ. Just as we live and work through our body, so the Lord Jesus does His work through His body. Each born-again believer is different from the other believers, but each is a member of Christ's body and therefore is important. Every believer has a vital function in the body of Christ. In our body we have many different members, such as eyes, ears, hands, and feet. Each member is different from the other members, but each has a vital function in the body. My hands cannot take the place of my eyes, and my eyes cannot do the work of my hands. Every member in my body is important. God equips every believer to do the work He calls him to do. God provides opportunities for every believer to serve Him. According to God's plan, the local church is to function as the body of Christ in a given locality. Every believer should be a part of a Bible-believing, Christ-exalting, local church. It is here that you can best learn what your gift is and how to use it. The local church is not the only place where you can serve God. 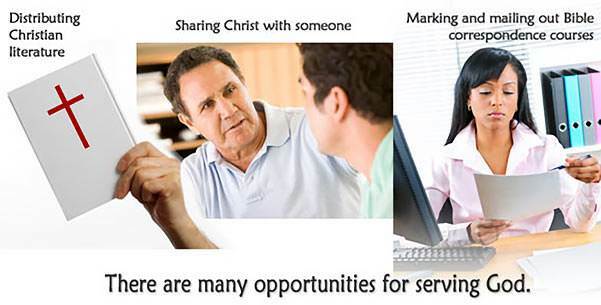 Many Christians are effective witnesses for Christ in their places of work. Some have Bible classes in their homes. Others give their lives to serve God as missionaries. Still others are winning people to Christ and grounding them in the Word of God by sending out Bible lessons, such as The Mailbox Club lessons. The opportunities for serving are virtually limitless, but you must find what He wants you to do. "Not only has God made each believer different, but He has given each of us his own special 'track' to run on, and we are not competing with anyone. God did not put all Christians on one track and say, 'All right, see who wins.' 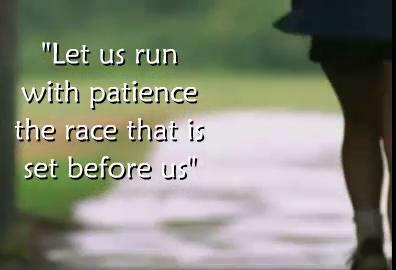 He has given each of us his own track, and He says to us, 'Run the race that I have set before YOU.' So all I have to do is find my 'track' (God's will for my life) and run my race." How can I find God's Place for Me? In Christ, God has provided every believer with an opportunity for serving Him. If you have not found the work God has for you, you are not fulfilling His purpose for your life. If you are wondering why you have not found the work God has for you, it may be because you have never given yourself totally to Him. God does not require every Christian to lay aside his job and preach the gospel full-time, but He does require us to be totally consecrated to Him. God has purchased us with the blood of His own Son. We belong to Him. It is therefore only reasonable that we give Him what rightfully belongs to Him. I was trying to explain to a physician who had charge of a large hospital the necessity and meaning of consecration, but he seemed unable to understand. At last I said to him, "Suppose, in your going your rounds among your patients, you should meet with one man who entreated you earnestly to take his case under your special care in order to cure him, but who should at the same time refuse to tell you all his symptoms or take all your prescribed remedies, and should say to you, 'I am quite willing to follow your directions as to certain things, because they commend themselves to my mind as good, but in other matters I prefer judging for myself, and following my own directions.' What would you do in such a case?" I asked. "Do?" he replied with indignation, "Do! I would soon leave such a man to his own care. For, of course," he added, "I could do nothing for him unless he would put his whole case into my hands without any reserves, and would obey my directions implicitly." "Is it necessary, then," I asked, "for doctors to be obeyed if they are to have any chance to cure their patients?" "Implicitly obeyed!" was his emphatic reply. "And this is consecration," I continued. "God must have the whole case put into His hands without any reserves, and His directions must be implicitly followed." "I see it," he exclaimed, "I see it! And I will do it. God shall have His own way with me from henceforth." If you do not take your hands off your life, God cannot use you. Suppose you give a book to a friend, yet your hand will not let the book go. Will your friend be able to use the book? No, he will not be able to use it until you take your hand off. 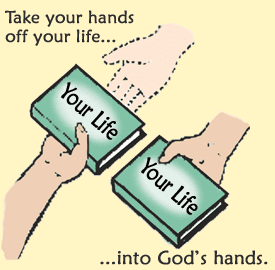 And God cannot use your life until you take your hands off and give yourself totally to Him. 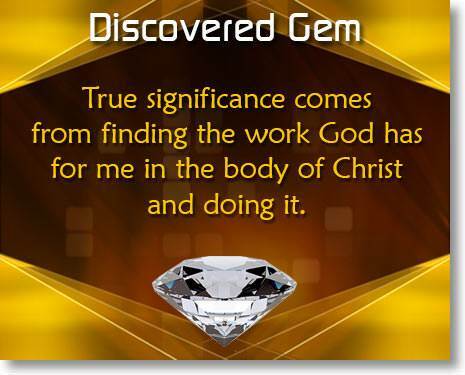 True significance comes from finding the work God has for me in the body of Christ and doing it. In Christ, God has provided every believer with a meaningful purpose for living. 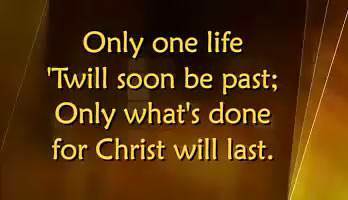 When I give myself wholly to Him to do His will, I become part of God's eternal plan. I know that I am worthwhile. There is nothing more important and more satisfying for me as a child of God than to be in the place of God's choice, doing the work He has for me. There will, no doubt, be times when I may feel that I am not a worthwhile person. But I am not to live by my feelings; I am to live by faith in God's facts. Do you remember the principle of Facts, Faith, and Feelings? 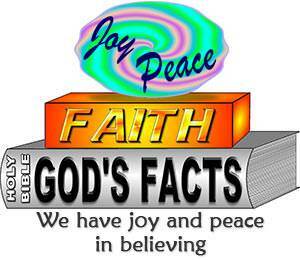 It is this: I am to put my faith in God's facts and let my feelings come along as they will. I am a worthwhile person because I am a member of Christ's body. God has a vital work for me, and He has given me the Holy Spirit to enable me to do what He wants me to do. "Lord, I thank You for giving me a vital place in the body of Christ. I am trusting You to show me the work You have for me and to enable me to do it." I have joy and peace in knowing that I am a worthwhile person.